This module is largely stand-alone. 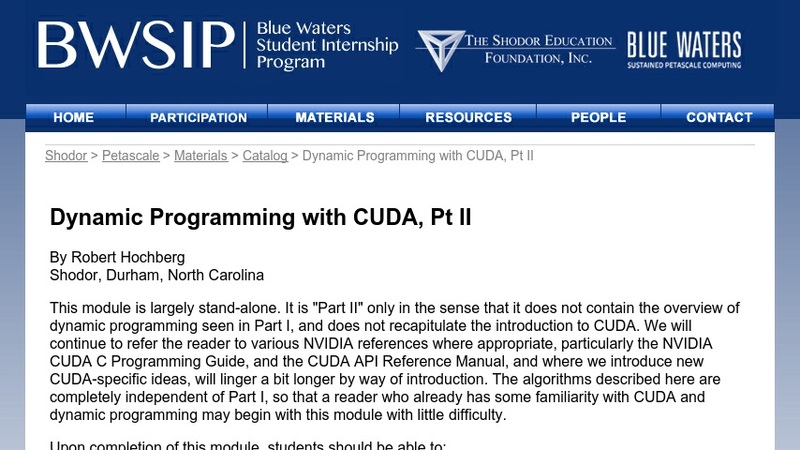 It is "Part II" only in the sense that it does not contain the overview of dynamic programming seen in Part I, and does not recapitulate the introduction to CUDA. We will continue to refer the reader to various NVIDIA references where appropriate, particularly the NVIDIA CUDA C Programming Guide, and the CUDA API Reference Manual, and where we introduce new CUDA-specific ideas, will linger a bit longer by way of introduction. The algorithms described here are completely independent of Part I, so that a reader who already has some familiarity with CUDA and dynamic programming may begin with this module with little difficulty.